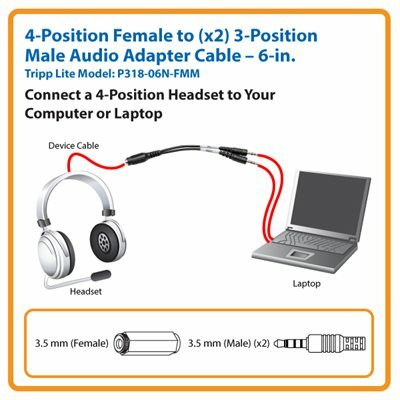 Tripp Lite 6in 4-Position Female to 3x2-Position Male Audio Headset Splitter Adapter 3.5mm 6"
The P318-06N-FMM 4-Position to 3-Position audio adapter allows you to connect your headset with audio and mic to the audio and mic ports on your computer or laptop. Use your headset on your computer or laptop with Skype, chat, and other VOIP applications. Constructed of 28AWG wire, and features a compact design perfect for tucking into your laptop bag when you're on the go. The P318-06N-FMM is a perfect solution for connecting 4-position headsets with microphones to your PC’s microphone-in and audio-out jacks. The P318-06N-FMM is manufactured to exacting specifications, using superior materials, for reliable performance and long life. For peace of mind, the P318-06N-FMM comes with a lifetime product warranty and is RoHS-compliant. Tripp Lite’s P318-06N-FMM Splitter Adapter Cable features one 3.5 mm 4-position female connector on one end and two 3-position 3.5 mm male connectors on the other end, allowing users to engage in VoIP telephone calls or video conferences on older PCs that use separate microphone and audio-out jacks. Simply connect your 4-position headset to the female connector and insert the P318-06N-FMM’s MIC and AUDIO connectors into your PC and get instant functionality with Skype, chat and other VoIP applications. The P318-06N-FMM is manufactured using only top-quality materials. Its 28AWG wiring ensures excellent data transmission and its single-piece, molded construction ensures years of long-term use. Its 6-in. compact design is perfect for tucking into your laptop bag when you’re on the go. When you choose a genuine Tripp Lite cable, you get superior performance plus peace of mind! We’re so confident of the quality of our P318-06N-FMM audio cable that we warrant it to be free from defects in material and workmanship—for life! Additionally, the P318-06N-FMM is manufactured in compliance with strict RoHS specifications, reflecting Tripp Lite’s commitment to environmental responsibility.